A walk down to my room after work, i often stop at a mall in front of a hotel, for tea. A glittering hotel inside a posh mall in Delhi NCR. Unfortunately, it's not the real tea but the vending machine owned by this hotel installed outside, always hovered by customers. 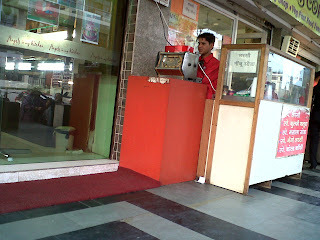 Behind the tea machine is a boy who offers his smile to me every time he readies to make tea. His smile comes from my regularity in visiting his machine. He works here with many other little boys, around 10 of them, who run around and are busy feeding customers. He may be around 15 years old and his friends are all hardly between 11 and 18 years old. I always felt compassionate about these little workers who hailed from Orissa and UP, for they were always smiling and had fun with each other whenever they got few minutes off their work, continuously handing out gol gappas and chaats and tea and cool drinks in the outside stall while inside the hotel they ran around serving the rich guests with delicacies and sweets. I always observed their lives because sometimes when I passed this glistening place late, when the rush of modern crowd of skimpy clad girls and fast-food lovers settled back into their nests, this whole mall corridors turned as the concrete beds for these workers' night shelter. The boy who supplied me tea didn't forget to offer his smile while I waited for him to brew the drink for me. I noticed he was very apt with his job doing his duty perfectly, that included ensuring if sugar and tea quantity was right. I would offer these kids chocolates whenever opportunity struck to which they always refused the first few times like a perfectly trained middle-class family child before finally sheepishly accepting the sweet token. I believed they were kids who did not know life fully yet and so they enjoyed with whatever they had, until one day, that is, on a Tuesday, I casually asked him when was his holiday, because almost all business was closed on this day except this hotel. To my dismay he said he had no holiday. He smiled as he poured tea into the cup stating he had not had a single holiday for the past 2.5 years. He very innocently and non-sarcastically told me his day begins at 5 am and only after his day ends at 10 pm after the hotel closes is what is his holiday time. As my smile dropped and eyebrow raised, he reciprocated with a drop of his smile too and turned serious. With a helpless look he asked me if i could get him a job somewhere. I was taken aback because I thought he was really happy there running around doing his job taking time to have fun with his friends with a joke or a prank while wearing that red uniform shirt, the pocket of which proudly displayed the royal hotel's name in embroidery. He continued, "I have not seen home for close to 3 years now. Sometimes I get a call on the hotel land-line from home but that's it. I am not allowed to go home." I comforted him saying that it may not be difficult for him to a get a job somewhere as there were lot of hotels around and asked him his salary. He smiled and said, "Rs.2000." I was aghast. He didn't stop.. "But I don't receive the full amount at all times because my salary is deducted for some or the other reason, sometimes Rs.100, sometimes Rs.500." I helplessly comforted him while sipping the tea he had lovingly made without any compromised attention on his job. I asked how does he sleep in that walking space to which he said all of them sleep there but the most horrible thing for him was to be awakened forcefully at 5 early morning with a splash of water. I tried to comfort telling him "So you have your food here and no rent to pay, so you may be saving your money." He looked a bit relaxed stating "Yes, but I manage to save around Rs.1500 as some amount goes for monthly toiletries also." I nodded. Here is someone who squeezes his needs of the whole month in a 500-rupee note and I wondered how much time it takes for us to blow a 500-rupee note or for that matter a two 1000-rupee note! I noticed he was neither complaining nor self-pitying but just expressing his heart out. He continued, "In the last two years I have managed to send home Rs.10000 only. For some months out of my salary about Rs.1500 was deducted for medicines because I had fallen ill."
I hid my pitiful look trying to fake up a smile ignoring his last sentence. Then, he said something that revealed it all on my face. "You know, my mother was recently hurt.. She had a huge cut on her hand (he demonstrated) but I was not allowed to go home..."
Unable to hide my inner feelings I just looked at him deep and i could no longer fake my emotions as he continued, "My dad died a year ago and I haven't gone home till now." I exclaimed "What??!" He smiled again. The more genuine his smile the more I was pained. The tea was empty in my cup and so were my words. As I kept the empty cup down he said with a smile, "Please see if you can find me a job." I nodded and bid him good night to which he shared his smile of consistent quality and continued to joke with his friend as they continued to wind up for the day. I walked away to my room leaving behind the false glitters of a so-called highly respectable, modern, decent, pompous, advanced, civilized, metropolitan society, the glitter of which not only hides the city's darkness but also the dark stories of these little weary souls.